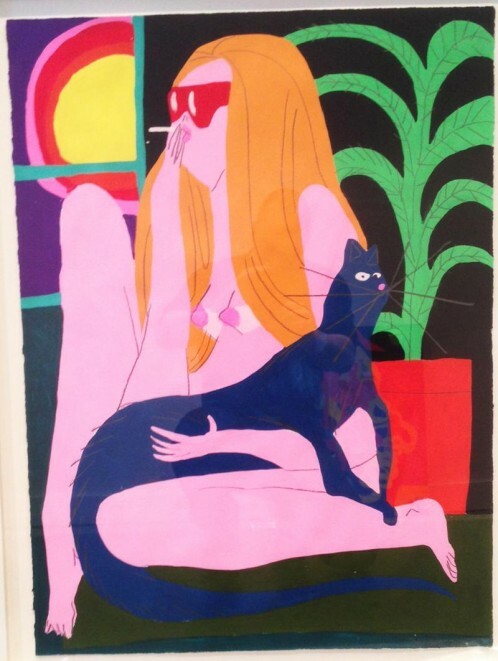 For Todd James’s third exhibition with Sandra Gering INC, he features his women: a colorful cast of warriors, sunbathers, sorcerers and girlfriends that have populated his work from its earliest years through today. Sometimes animated, sometimes relaxed, usually scantily clad and almost always humorous, these characters have proved to be emotional touchstones in a narrative that has balanced comedy and tragedy since the beginning of the artist’s career. The paintings and drawings are laced with metaphor and do not shy away from off-color humor. On occasion, women even find themselves morphed into magical hybrid characters or completely abstracted, as if spells had gone wrong and figures reassemble. Their range of expressiveness belies the heavy metal/fantasy atmosphere that has become one of the signatures of James’ work.